Published this week, our new paper describes a spectacular 400 million-year-old 3D-preserved fossil fish, Ligulalepis. The 3D anatomy of the fossilised Ligulalepis skull reveals previously unknown details of the pattern of dermal skull bones, the shape of the brain cavity, and other soft tissue features (such as nerves and blood vessels) in this species. Why are we so excited about discovering the structure of an ancient fish skull? Because Ligulalepis sits in a very important position in the vertebrate evolutionary tree. Fishes are the most diverse group of backboned animals (vertebrates) on the planet, with roughly 30,000 known species. The vast majority of these (around 98 percent!) are bony fishes or osteichthyans. These includes most of fishes we like to eat, such as salmon, tuna and trout, as well as fishes we keep as pets, like goldfishes and guppies. These are called ray-finned fishes (actinopterygians) as their fins are supported by bony rods called fin-rays. The other major group of bony fishes have robust lobe-fins (sarcopterygians), a group that contains the living lungfishes and coelacanths, as well as several extinct groups. Sarcopterygians are an important group because the first four-legged land animals, the tetrapods, evolved from them. Today we can regard all living tetrapods (amphibians, reptiles, birds and mammals) as a subgroup within the bony fishes. The first discovery of the fish called Ligulalepis was a tiny fossil fish skull found in limestone near Wee Jasper in New South Wales about 20 years ago. It has fuelled debate around early osteichthyan evolution ever since, without any clear resolution as to where this enigmatic fish sits in the family tree. Then, about two years ago, a second skull of this fish was discovered by a Flinders University student, Benedict King. The specimen was found in the same limestone outcrops near Wee Jasper. It was also preserved in 3D, but was even more complete than the original specimen. Earlier work by us recognised electroreceptive sensory pits in this skull of Ligulalepis. Both the old and new skulls were the focus of our new paper. Our team first prepared the tiny more recent specimen (less than 2cm in length) out of the rock using using weak acetic acid to expose the bone, as the carbonate rock dissolved. Then we used micro computed tomography (CT) scanning to visualise the skeletal anatomy of the two known Ligulalepis specimens. Powerful X-rays pass through the bones to reveal many hidden features inside the skulls. The scans revealed a perplexing mixture of characters in the skulls of these fish. Some features, like the shape of the inner ear canals, seemed to belong to cartilaginous fishes such as sharks. Other features, like the overall shape of the brain case, were clearly osteichthyan (bony fish) characters. The pattern of bones that form the skull roof was an unexpectedly primitive feature also seen in an extinct group of jawed fishes called placoderms. The CT technique enabled us to reconstruct what the brain cavity of this 400 million year old fish looked like, allowing us to digitally restore the brain shape for the first time (see video below). Prior to our detailed analysis of this skull, some scientists considered Ligulalepis to be closely related to the ray-finned fishes. Others placed it alongside lobe-finned fishes. 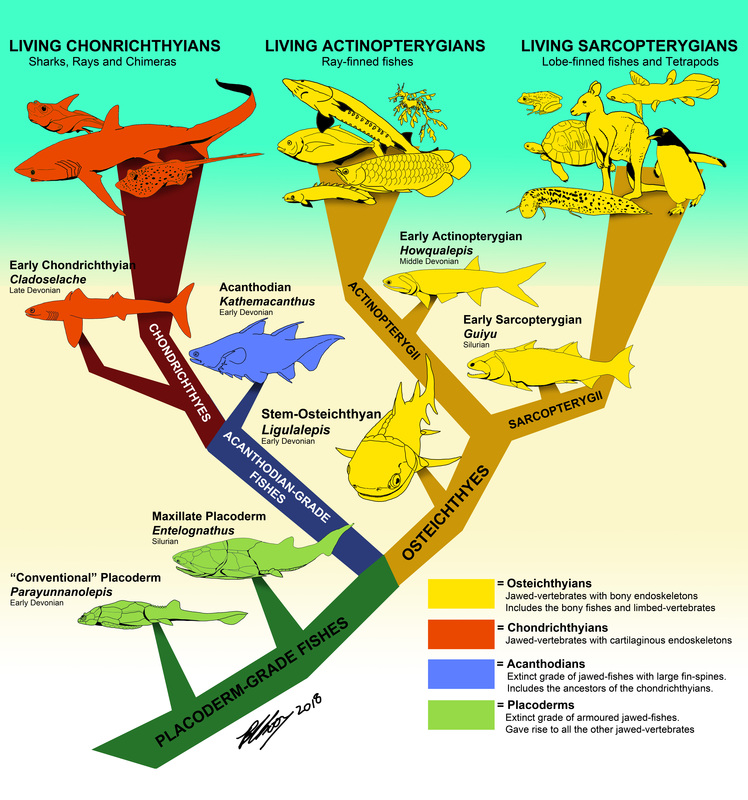 A third school of thought envisaged it even lower down on the fish family tree – and this is close to where we have now placed it, on the "stem" of the tree leading to the true osteichthyans. Its unique position on the tree of life means that Ligulalepis provides great insight into what the ancestor of the two major radiations of bony fishes looked like. Furthermore, the detailed analysis of its newly revealed characters helps to clarify the early evolutionary radiation of all animals with a bony skeleton - including us humans. Most modern fish are ray-finned fish (actinopterygians), with around 29,000 living species. Their origins can be confidently dated back to the Middle Devonian, around 390 million years ago with fishes like Cheirolepis from Scotland. However the existence of the related group "lobe-fins" (sarcopterygians) is much older, with early representatives of that group such as Guiyu, from China, dated at about 430 million years ago. This suggests there are some parts of the early fish fossil record that are poorly understood. Our fossil and the new analyses we have performed helps to resolve the big question about what the ancestor of all modern bony fishes looked like. It also illustrates the sequence of changes these early fish went through to achieve their modern "body plan". Also, our analyses show that Ligulalepis was the closest known species to a peculiar group of early lobe-finned fish called "psarolepids" known only from China. It supports the hypothesis that the first early boney fish originated and radiated in China, then migrated out via East Gondwana (Australia and Antarctica), the part of the southern supercontinent closest to the ancient Chinese terrains. Our findings highlight that the evolutionary family tree of the first bony fishes is much more complicated than we had thought, demonstrating the importance of palaeontology to help us more accurately understand our distant origins. Alice Clement, Research Associate in the School of Biological Sciences, Flinders University and John Long, Strategic Professor in Palaeontology, Flinders University.